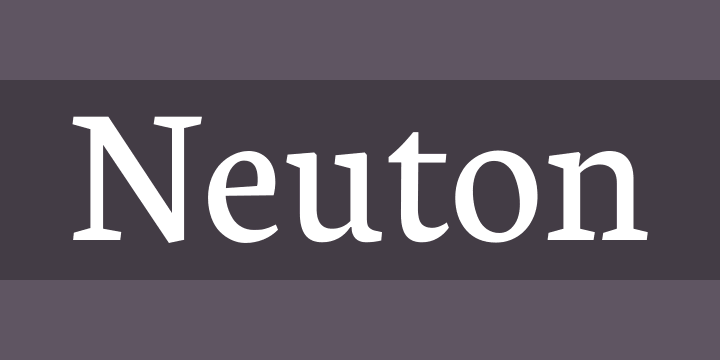 Neuton is a clean, dark, somewhat Dutch-inspired serif font which reminds you a little of Times. It has a large height, short extenders, and a compact width for better screen use, and economy of space. The family will comprise a regular, italic, and cursive, each in five weights and with smallcaps. Two italics — one will be called “italic”, and the other “cursive” — are uncommon, but very useful. Ever tried emphasizing something already emphasized? Beyond that obvious example, there are other uses. Sometimes a text needs a different flavor or feel. While one roman can work for a variety of texts, the companion italics don’t always. In more classical or personal documents, a stiff, sober, modern and down-to-earth italic will never work. And in many essays, some of the fancier italics look ridiculous. Who said a roman needs only one companion? - Removed full text of the OFL and minor tweaks.